Happy Easter to each and every one of you. We have been blessed with the weather here in Brisbane, lovely warm sunny days and cooler nights. Somewhat of a novelty for this time of year, it nearly always rains for Easter. Picking the Ray of Sunshine is hard, all of your entries were gorgeous and fabulous. However, our winner this week is Shawnie with this gorgeous card. 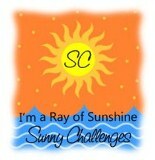 And here is our badge for Shawnie to add to her blog. Please take the time to visit Shawnie and let her know how much you love her gorgeous creation. Check back tomorrow and see what challenge we have in store for you for the coming week. We love seeing all your fabulous work, though it does make it hard to pick our Ray of Sunshine. Oh my goodness! With all the beautiful and creative entries that were shared I am humbled that my card was recognized - it could have been any one of us. I am so glad I found this site so i can participate in the challenges. I am humbled to have been selected as this week's recipient! There were so many beautiful and creative cards. No way could this task be an easy thing, to have to decide who is worthy.